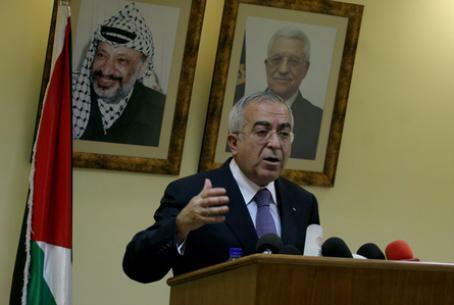 PA PM Salam Fayyad says "the Palestinian cause" has never been more marginalized, attacks Israel for building in Judea and Samaria. Palestinian Authority Prime Minister Salam Fayyad has charged that “the cause of the Palestinians” has never been more marginalized than it is today. He was strongly critical of the West’s failure to tackle Israel more “seriously” over what he termed its “violations of international law.” Fayyad declared that this “marginalization” was now the “biggest obstacle” to progress towards a Palestinian state. He charged Israel of conducting nightly incursions into cities designated under the Oslo Accords as Area A which is under control of the Western trained PA security forces. “There is not a night when there are not multiple raids or incursions in Area A,” Fayyad said, adding that Prime Minister Binyamin Netanyahu had been in the cabinet that had accepted the internationally agreed Road Map which, among other things, had called for a halt to Jewish building in Judea and Samaria. “It really is outrageous. There is not a single requirement of the road map that the government of Israel can assert they are complying with. Not one,” he said. Israel froze construction in Judea, Samaria and Jerusalem for ten months in 2009 at the request of the United States, in an attempt to bring the sides back to the negotiating table. However, PA Chairman Mahmoud Abbas chose to avoid resuming negotiations and instead chose to continue to impose preconditions for talks. He has demanded that Israel accept the indefensible pre-1967 lines as final borders, release all Arab terrorists from its jails, and halt construction for a second time before talks begin. He has warned that he may seek non-member status for a Palestinian state at the United Nations if peace talks with Israel do not resume. Fayyad noted that the most immediate threat is the current financial crisis of the PA, which despite the huge strides made in financial management under his premiership, left it unable to pay employees salaries in full last month. “When you start every day wondering whether to pay pharmaceutical companies for medical supplies or pay some other supplier, crisis management overrides everything else,” Fayyad told The Independent. He said that the financial crisis, despite being a matter of a “few hundred million dollars”, is a function of a distracted international community - including the region’s Arab neighbors, from whom emergency aid is normally more easily forthcoming.